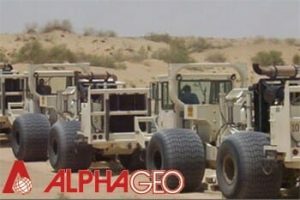 Alphageo (India) Limited (Alphageo) is the largest private onshore integrated seismic service provider in India. Incorporated in 1987, the Company’s globally benchmarked competence comprises acquisition, processing and interpretation of seismic data for oil exploration. Alphageo offers topographic surveys with GPS and Real Time Kinematic (RTK) positioning; tape transcription; digitization of hard copies of maps, seismic sections, and well logs into CGM, SEGY, and LAS formats; and third party quality checking for acquisition and processing. Seismic survey is highly knowledge and capital intensive. Given the nature of work, technical capabilities, technologies and equipment, prior experience with similar topography, and timely execution of projects acts as entry barriers. Companies need to regularly make investments in acquiring technologies and equipment. International players that also compete in the Indian subcontinent include CGG Veritas Ltd, Western Geco Ltd and Petroleum Geo-Services ASA. However, most of these international players largely focus on off-shore and deep water reserves rather than onshore reserves. The Company has a tie-up with Alphageo USA, in the field of human resource development (HRD) for conducting advanced geo-seismic surveys in difficult terrains. Reflection seismology (or seismic reflection) is a method of exploration geophysics that uses the principles of seismology to estimate the properties of the earth’s subsurface from reflected seismic waves. The method requires a controlled seismic source of energy, such as dynamite / specialized air gun. 3D seismic survey helps the producer to monitor the quality of the producing reservoir and optimally produce oil/gas. Ageing fields could also be monitored through carpet 3D seismic survey in order to avert dip in the production. In addition unexplored areas could be appraised through 2D seismic surveys. Around 77% of energy requirement in India is imported and the government targets to reduce it by at least 10% by 2022. As per Directorate General of Hydrocarbons (DGH), India’s 26 sedimentary basins have not been exploited to optimum levels. This led to various initiatives by the government in the interest of upstream oil & gas companies in order to encourage domestic as well as overseas players to explore further. Among the programs, the National Seismic Program (NSP) aims to undertake a fresh appraisal in all sedimentary basins across India, especially where no/scanty data is available, to have a better understanding of the hydrocarbon potential of India. Under this program ONGC and Oil India have been entrusted to conduct 2D seismic Acquisition, Processing and Interpretation (API) across India. The Government has also launched India’s maiden National Data Repository (NDR) that will assimilate, preserve and upkeep country’s vast sedimentary data for future use in oil and gas exploration and production. Under the open acreage licensing policy (OALP), domestic as well as global O&G companies can visit NDR and look at vast seismic data of unexplored areas and bid for the potential areas to be explored further. Explorers will be able to access sedimentary block-level data before seeking petroleum-production licenses. OALP is covered under Hydrocarbon Exploration Licensing Policy (HELP) which has replaced New Exploration Licensing Policy (NELP). Alphageo is one of the few seismic survey companies in India who have survived the downturn of last few years. During those years company ventured out of India and got some order from Myanmar. This enabled the Company to survive where most of its peers perished. The Company has managed to remain debt free despite adding/upgrading their systems with the latest available. Thus despite being a small company it has the ability to take up big orders by leveraging its balance sheet to an extent. The Company in 2016 won one of the largest orders in India of Rs. 1482cr from ONGC under the national seismic program. It related to acquisition of 2D seismic data in un-appraised on land areas of Indian sedimentary basins of India as a part of the NSP to be completed by June 2019. Other orders include provision of 2D seismic acquisition services in the areas covering parts of Assam & Arunachal Pradesh for an estimated contract value of Rs. 102 cr, under NSP to be executed by November 2018. The Company is also nearing completion of contract from ONGC for 3D seismic data acquisition in the area of KG basin for an estimated contract value of Rs. 242 Cr. In Q3FY18 Alphageo won a fresh contract of Rs.131 cr from ONGC for carrying out seismic acquisition in Mehsana, Gujarat to be completed by January 2019. The government has initiated ‘Discovered Small Field Policy’ with an objective to increase domestic production. This policy targets monetizing 67 small fields by providing incentives to the explorers/producers. This could require 3D seismic services. Further it includes carpet 3D surveys (similar to KG basin -ONGC) for producing fields across India to avert drop in production likely to open up further on land seismic orders for the company. Being a prominent on land seismic service provider in Myanmar, company is likely to widen its presence in different geographies of the world through alliances and acquisitions. Seismic survey in transition zone (the interface area between the sea and land) is expected to open up new avenue of business for Alphageo since coastal regions of India are under explored. Alphageo is expected to benefit the maximum out of increasing initiatives towards exploratory activities by the government as it has presence in every stage of the production cycle of crude oil. Its services include design and pre-planning surveys, acquisition of seismic data, its processing and interpretation, generation, evaluation and ranking of prospects. It is the only domestic player with relevant experience in each stage currently & it has the ability to handle difficult terrains.